I'm sure you noticed by now, life has its 'ups and downs'. Some days you are the dog, other days you are the hydrant! Ever feel that way? I have. Now that I have your attention, here's a story that has brought me perspective and encouragement in those hydrant days. It was sent to me years ago by a friend who is a Major in the Air Force. Instead, he called his neighbors together and told them what had happened. He enlisted them to haul dirt to bury the old mule in the well and put him out of his misery. Initially, the old mule was hysterical. But as the farmer and his neighbors continued shoveling the dirt on his back a thought struck him - that every time a shovel load of dirt landed on his back he should shake it off and step up. This he did, blow after blow! 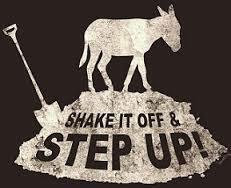 He kept saying..."shake it off and step up...shake it off and step up...shake it off and step up!" No matter how painful the blows. No matter how distressing the situation. The old mule fought panic, fear, and self-pity. He just kept...shaking it off and stepping up. You're right. It wasn't long before the old mule, battered and exhausted, stepped triumphantly over the wall of that well. What seemed like it would bury him, actually blessed him. Why? It was all because of the manner in which he handled his adversity. Perhaps the challenges and adversities we face have in them the potential of benefit and blessing. It's all in the way we respond to our problems. Kites fly highest when facing into a big wind. Sir Edmund Hillary, the first to climb Mt. Everest, sums it all up after he failed in his first attempt to climb the mountain. As he was descending the mountain, he suddenly turned, looked up, and spoke to 'his' mountain saying...."I'll come back and I will climb you because you can't get any bigger but I can!" The rest is history. Perhaps we can learn from Sir Edmund Hillary, and an old mule who wouldn't give up - the next time we have one of those ‘hydrant’ days...shake it off and step up! Didn’t I say a few weeks ago…never, never, never give up? Why should we shake it off and step up? You will find that ‘better’ lives there.